The Department was founded by a resolution of the Trustees on June 1, 1852 with John Henry Alexander as the Professor of Civil Engineering. John Fries Frazer, Professor of Chemistry and Natural Philosophy in the College, expanded his duties to teach those same subjects in the Department of Mines as did E. Otis Kendall, professor of Pure and Applied Mathematics. Charles Trego was appointed Professor of Geology and Mineralogy. Problems with financial and organizational support for the Department precluded the beginning of instruction in that year. By 1855, Alexander had resigned, and Fairman Rogers was appointed in his place. 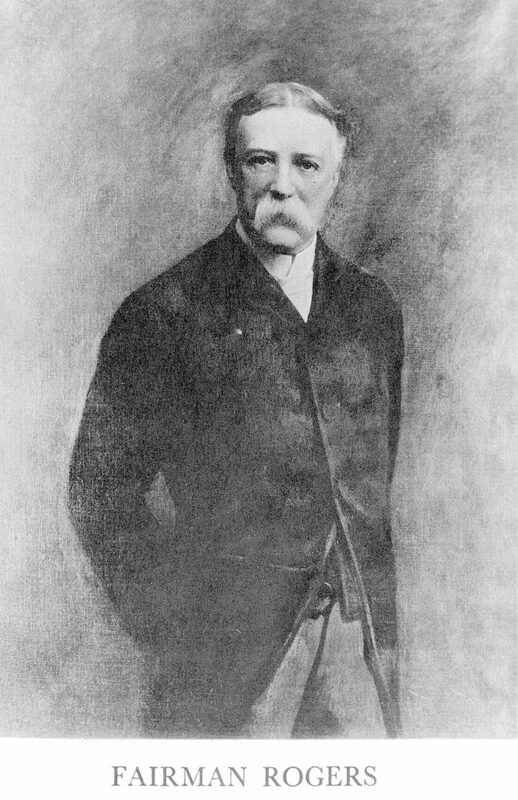 Rogers, the son of an iron merchant, had graduated from Penn in 1853 and had spent the intervening years on a tour of Europe and surveying the marshes of Florida under the command of Bache. With the young civil engineer (he was in his mid- to late twenties during his tenure) occupying the deanship, the Department of Mines took off. The success of Rogers’s first course in 1855 led to the beginning of courses in other subjects the following year. A Professor of Mining was finally appointed for the 1859-60 school year with J. Peter Lesley, librarian of the American Philosophical Society, accepting the position. 8. Calhoun, David Hovey, The American Civil Engineer: Origins and Conflict (Cambridge, MA: The Technology Press,1960), 52. 9. Stephen van Rennselaer to Rev. Samuel Blatchford, November 5, 1824. quoted in Palmer C. Ricketts, History of Rennselaer Polytechnic Institute, 1824-1934 (New York: John Wiley and Sons, 1934), 9; Ricketts, History of Rennselaer Polytechnic Institute, 25-6; Mann, Charles Riborg, “A Study of Engineering Education” Bulletin of the Carnegie Foundation for the Advancement of Teaching 11 (1918), quoted in Ricketts, History of Rennselaer Polytechnic Institute, 29; Durfee, Calvin, A History of Williams College (Boston: A. Williams and Company, 1860), 371. 10. Warren, Charles H., “The Sheffield Scientific School from 1847 to 1947,” in The Centennial of the Sheffield Scientific School, ed. George Alfred Baitsell (New Haven, CT: Yale University Press, 1950), 59. 11. Charles Eastwick Smith to John Fries Frazer, March 8, 1852, “1852-School of Mines”, Archives General Collection (UPA 3), University of Pennsylvania Archives and Records Center, Philadelphia, Pennsylvania. 12. Ricketts, History of Rennselaer Polytechnic Institute, 12; Resolution of the American Iron Association communicated to the Trustees of the University of Pennsylvania, March 20, 1855, Minutes of the Board of Trustees of the University of Pennsylvania, Vol. 10, 1852-1869, University of Pennsylvania Archives and Records Center, Philadelphia, Pennsylvania. 13. Morrill Act of 1863, 7 U.S.C. § 301 (1863); Rogers, Fairman, “Historical Sketch of the School of Mines, University of Pennsylvania,” “1857-School of Mines,” Archives General Collection (UPA 3), University of Pennsylvania Archives and Records Center, Philadelphia, Pennsylvania; “An Act To accept the grant of Public Lands, by the United States, to the several states, for the Endowment of Agricultural Colleges,” no. 227, General Assembly of the Commonwealth of Pennsylvania (April 1863); Rogers, “Historical Sketch,” 13; For more discussion on the push for state recognition of the Department of Mines, see Edward Potts Cheyney, History of the University of Pennsylvania 1740-1940 (Philadelphia: University of Pennsylvania Press, 1940), 253-256. 14. Students pursuing the scientific course in the College also graduated with a B.S., but their education was primarily in pure science; what engineering education they received while at Penn came through the special course in the Department of Mines. 15. Dublin and Licht, The Face of Decline, 19. 16. “Alfred Pancoast Boller.” The Engineering Record. Dec. 5, 1903, 706.